Gently nestled among the palm tress and mountains of South Palm Springs, this fully gated Twin Palms estate has spectacular mountain views from nearly every angle. Ideal as a getaway for family and friends, this 4,000 square foot residence boasts 4 large bedrooms with king-sized beds and a den with a queen-sized convertible bed. 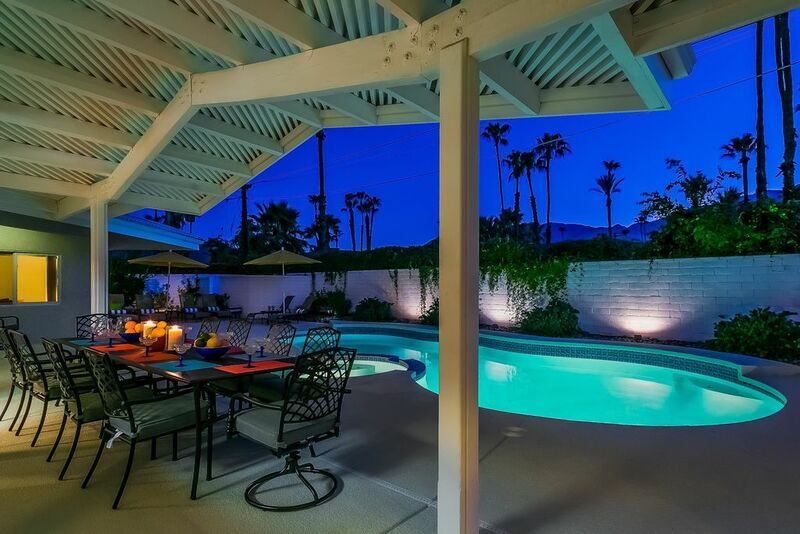 Embrace elegant Palm Springs living and experience unbelievable poolside sunsets from the private backyard, which has a pool flanked by 10 chaise lounges, a spa, gas barbeque and dining area for twelve. A sunken wet bar off the living room is perfect for cocktail hour while dinner is prepared on the granite countertops of the gourmet island kitchen. Throw a dinner party for twelve in the expansive dining room or simply order in and snuggle up to one of the home’s three fireplaces and enjoy a movie on the brand new flat screen TVs, which all have cable and Netflix. No matter how you spend your time here at Vista Montaña, you and your guests will marvel at the comfort and privacy of this contemporary Palm Springs home. • Shopping and fine dining located a short drive to the village. nail salon, post office and a host of smaller stores. Living room is adjacent to the ding room. Sunken wet bar in the living room. The property was very comfortable and easy to use. The Great room/kitchen area was the only area used by my group. At night, there was scratching sounds coming from the attic/roof area. The assumption was that the noise was from roof rats. There was no evidence that they were inside the house. The kitchen sink that overlooked the pool area had such excessive pressure that turning the water on caused excessive splashing on the counter and person. The front gates were inoperative due to an accident that bent the gate at a 45 degree angle. This made it difficult, but not impossible to use the driveway with anything larger than a compact car. House was perfect for our needs, even though we had a couple of plumbing problems. Hope this house is still available when we come back next year. House was super spacious; all seven of us adults loved it! It is located about two miles from downtown Palm Springs. Location is good for seeing Palm Springs as well as Indian Canyon, the Salton Sea, Joshua Tree, etc. We walked to town almost every day and often walked to the grocery store. There is a queen size bed in each of the four bedrooms. Two bedrooms share a "Jack 'n; Jill" bathroom. WiFi worked great throughout the house. The kitchen is open to the family room which allowed us to cook and socialize at the same time.. The grill in the backyard was a plus since we love grilling. We used the jacuzzi despite the cool weather during the latter part of our stay. The house is well stocked with many, many towels towels. It was like home away from home. We really enjoyed our stay. We stayed at this property almost an entire week and it really felt like home. We didn't want to leave on our last day. Everything about our stay exceeded our expectation and we will return again if this house is available for our next stay. House is very clean with great amenities and neighborhood. Will definitely recommend this house to our friends and family. We stayed over the 2018 Thanksgiving weekend. The house is laid out so everyone has some elbow room, which is great when you get 8 adults in one house. The bedrooms were spacious, everyone had a bathroom. Our family spent the majority of our time in the backyard in the pool. The weather was picture perfect and gave everyone a chance to catch up. Close to the grocery store and downtown Palm Springs and a quick 7-8 minute drive to the airport. We would rent again when down in the area. Utility rate of $45.00 will be added to quote as well as a $200.00 housekeeping fee.